Looking for new opportunities, giving companies the chance to scale, taking financial risks, supporting companies... Cleantech investors have a crucial role to play in the race to build a sustainable future. In our latest series, we meet with the individuals and companies who are involved in financing the cleantech revolution. 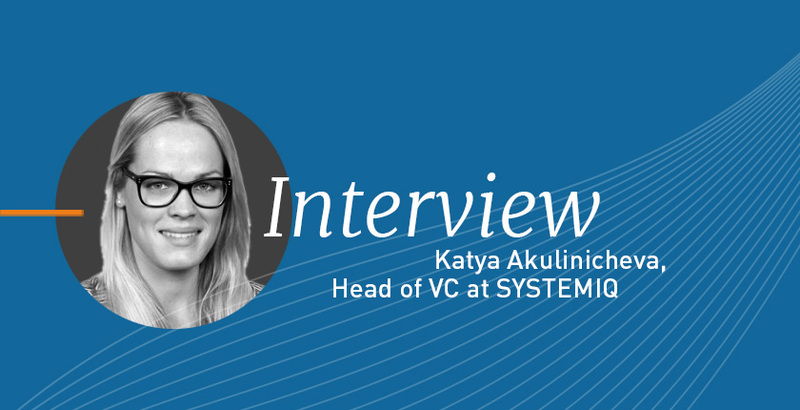 In this first interview, we discussed with Katya Akulinicheva, who currently oversees the investment activities of SYSTEMIQ. Can you tell us more about SYSTEMIQ? The second layer is consulting and advisory. We do things quite differently from traditional consulting companies. We work with our clients on a longer-term basis, almost like partners. Our goal is to support them in implementing change rather than staying on a strategic level. In addition, we also have some incubation activities. We also create with our partners solutions for addressing important sustainability challenges. For example, Project STOP, co-founded by Borealis and SYSTEMIQ, is a city-partnership creating circular waste management systems in Indonesia to prevent ocean plastic leakage and create jobs and income-generation opportunities for the local community. Finally our third activity is early-stage investing. We support early-stage disruptive technology companies that fit into our overall change model and our mission. We invest in profitable, scalable, commercial solutions to climate and sustainability challenges. What is SYSTEMIQ's specific approach when investing in a company? Our specificity is to always take a collaborative approach. If there is a round with multiple people involved, we don’t fight for a lead position. We consider our money to be an entry point into the opportunity to support a company rather than the primary reason we engage with them. So we try to take an ecosystem development approach. Actually, the more other capital we bring in this round, the better. Leveraging our money to bring more money is a big part of the way we think about our role. What are your main criteria when you invest in a company? We obviously have some traditional VC criteria. When we look into an investment opportunity, we look at the team’s competencies and complementarity, the market size, the development of the product, etc. We do late seed investments, Series A and sometimes Series B. We usually invest in companies at an early stage but who already have a certain commercial traction. Then, our second criteria is more focused on how a company fits with SYSTEMIQ activities. What we’re really trying to find are opportunities where we can be a differentiating investor. We want these investments to be synergistic with our work. The deeper we go into areas that we really know well in our advisory role, the more likely we are to successfully support our portfolio companies. Before deciding on an investment, we spend a lot of time discussing “How can we really make a difference in this venture? How well do we know the industry? Can we help them figure out their pricing model and their potential clients?”. Therefore, we only invest in companies that have a close link to the rest of our work. Broadly speaking, what would you say is the particularity when investing in a cleantech company? It really depends on which sector you’re looking at. But overall, there are some things which are common to a lot of cleantech companies. First, many of them are B2B, which is already a big challenge. Another particularity is that we often look at regulated markets or markets that don’t fully exist yet. The way things unfold in the cleantech space are a bit less predictable than other industries. For example, we don’t know exactly what the uptake of residential solar batteries will be. While we we all believe in the future of distributed energy, we don’t know exactly when it will happen. On the material side, we are all now aware of the plastics pollution challenge, but today the alternatives are expensive and until the government puts in some sort of tax, these alternatives won’t really get off the ground. So there’s definitely much more uncertainty and therefore more risks when investing in companies in those sectors. What are the current trends in cleantech that you’re you looking at? I am really curious on how Artificial Intelligence will impact the cleantech sector, especially in the understanding of climate risks, how we’re able to forecast them and actually translate them into real measurable economic risks. We recently closed an investment in a company called Jupiter Intelligence who has developed algorithms which give an understanding of how climate change will affect infrastructure assets in the short-term. This impacts how you insure them, how you finance them, and should ultimately support a reallocation of capital towards more resilient assets. The second area I’m very interested in is material innovation, and especially finding alternatives to plastic. The whole topic has gained so much visibility in recent years but when you look at what has actually been done, we don’t really have alternatives yet. So I’m really interested to see innovations both on alternative materials but also different models that avoid the need for that material altogether.